Thanks to Oh Nuts I got to review some of their items! I picked the apple rings, peanut clusters and the Viennese Crunch. I love apple rings and they are hard to find here in the stores so I was excited to find a place I can order them online! They are YUMMY! The peanut clusters were fresh and great! The Viennese Crunch was so good and has a mixture of caramel, chocolate and nuts. YUM! Thanks Oh Nuts for the great products! Go to www.ohnuts.com to check our more of their products! www.ohnuts.com has developed a rather enviable client base that's comprised of personal and professional customers who count on our remarkable range of gift baskets (every one of them is one of a kind in way more ways than one) to make them look good to friends, family, clients and co workers. Regardless of whether it's a single basket going to Sacramento or 5 dozen New Year's baskets needed overnight for your clients throughout North America, you can count on "Basketland"--our fully computerized, 10,000 plus square foot "nerve center" to make it happen. And because "Basketland" stocks all the items you'll find on our website (yes, all 2000+ of them) you can customize your basket to suit the occasion, recipient or budget—without turning yourself into a basket case in the process. Regardless if your tastes run salty or sweet, spicy hot or sour power puckering you'll find a solidly suitable selection of sweet tooth satisfying stuff that you can order by the pound, pint or price…in short, what you want, the way you want shipped where you want to arrive when you want. away one 48 pack of fruit leather. Cool stuff, I am in! I always love new tips on where to find some yummy food!! I have been gone so long you went and got a new look on me! I just wanted to say even though I have'nt been blogging... I still think about u!!!!!!!! I can't wait till I am out of this hell of a mess i am in! We can buy these at Costco, and my girls love them. Count me in!! your button on my blog ! If children like something sweet Fruit Leather is much better for their lunches than candy bars. Shauna your giveaways are awesome! Oh YUM!!! We love the fruit leather... my brother asks for it on his mission even!!! :) I haven't tried any of their other products though... sooo thanks for the info on them!!! You're great! My little boy loves fruit leather! Gotta that cute button of yours! oh wow, fruit leathers are some of my favorite snacks.. a 48 pack would be absolutely AMAZING! big thanks to you and oh nuts for the giveaway! Would love to win fruit leather! Yum! What a great looking snack! Viennese Crunch sounds so delicious! 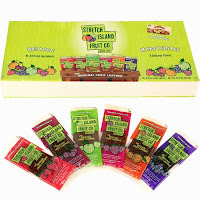 I love stretch Island Fruit Leather! I always stock up when I go to trader joes. I would love to send these to school with my daughter on the days when she has class parties. So much healthier than the typical cupcake she has! My kids and grandkids have never tried these before but I'm sure they'd like too. Please enter me for a chance to win to try them out.